And most important: HAVING FUN! Practical Life – All children are encouraged to behave independently according to their individual development level. The staff encourage children to problem solve creatively, to learn to accept and appreciate diversity, and negotiate for what they want when it is in conflict with another’s desires. Staff will assist children in areas of practical life and self-help skill development by providing activities that encourage using undeveloped skills. The goal for children of all ages is to promote positive self-esteem and competence. Whether buttoning, pouring, folding, preparing food, or cleaning a table, children experience real life situations and activities that encourage them to expand their independence. Learning Centers – These are areas set up by teachers and students and are changed monthly to fit the theme for the month. Learning centers have activities that are suggested either by written or verbal cues from the teacher or can be developed daily by the children. Materials and equipment in each area are displayed in a manner that promotes individual and independent play. Often, problems are presented for children to solve for creative and cooperative problem solving sessions. 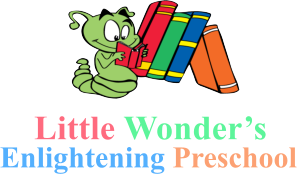 Monthly Themes – The program has general monthly themes that are established and coordinated center wide from infants to school age, designed to promote developmental skills, and to enrich all children’s understanding of their world. The themes have educational, social, cultural, and emotional value. Arts and Crafts – The majority of our projects are focused around the holidays and theme units. 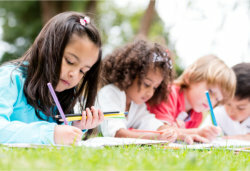 Arts and Crafts projects stimulate a child’s mind to be creative. These activities also assist in the development of fine and gross motor skills. Children also achieve a sense of pride and accomplishment through the development of projects. Our program is filled with hands-on learning activities as well as open-ended art activities. Open-ended art allows the child to explore the use of various materials and enjoy the process. Craft projects are designed to help the children develop their creativity and the use of specific skills. Uneven or lopsided projects are to be expected from children of this age. The children are in the process of learning. It is the “process not the product” that is important. Please keep this in mind and treat all of your children’s projects as masterpieces! Letters and Numbers – Children will learn to recognize, identify, and eventually write the numbers and letters. We will concentrate on one letter and one number each week. During this time, many of our songs, crafts, and games will focus on the letter and number of the week. Pre-Math and Science – Early Math and Science include. Math skills that focus on number recognition, counting, sequencing, patterns, charts, and addition. Science will consist of exploring the world around us and simple science experiments, usually focused around the theme of the week. Manipulatives – Manipulatives develop organizational skills like sorting, counting, comparing, classifying, matching, and shape recognition. Children integrate concepts through more physical involvement by using more senses, children will form more associations. Sensory Experiences – Children will be provided with a wide variety of hands on, concrete, real world sensory experiences appropriate for the child’s age and stage of development. They will learn about all of their senses and how to use them. Computer Skills – Games appropriate for each child’s age and developmental level will be introduced. Kindergarten Readiness – Children will be given the opportunity to learn basic skill allowing for a brighter future as they enter kindergarten.